It used to be that praying the Psalms was something all Christians did every day. They did this privately and in church. Everyone learned to pray from the Psalms and in the process came to understand “the anatomy of the soul,” as John Calvin called it. But Praying the Psalms is a lost discipline today. Rarely is even one whole Psalm read or sung in church. But in many church services you rarely if ever sing a lament Psalm. The laments are the sad songs and prayers of the Bible. Without them we’re likely to feel alone or guilty when we’re struggling with sadness, grief, depression, or feeling abandoned by God. How are people to learn how to express their pain to God and to pray through it, trusting God? Coinciding with my spiritual renewal that began in 2002 I have been benefiting from many ways of praying the Psalms which I’d like to share with you. The most important way of praying the psalms is to pray them with Jesus. Often the Psalms reminded me of Jesus’ life and words and this makes for fruitful meditation. The Psalms help me to learn to pray with Jesus and like Jesus; they help me to become a person after God’s own heart in the midst of my daily life. Jesus quoted from the Psalms numerous times. Clearly he had spent a lot of time praying through the Psalms — probably, like other Jews in his day, this is how he learned to pray. Jesus lived the Psalms. Often he identified his life experiences in those of the Psalmist. There are many Messianic prophecies in the Psalms that Jesus lived out, proving that he is God’s Messiah. And Jesus fulfilled all of the Psalms in the sense that he perfectly completed the righteous and honest life of prayer that they express. For instance, Jesus is the Psalm 1 Man. In his humanity Jesus relied on praying the Psalms for comfort, wisdom, and worship in many different experiences. He needed the psalms because he felt all the same basic struggles and temptations that we do. The most moving example of Jesus praying a Psalm is when he hung on the cross, suffering for our sins, and he cried out in a loud voice the heart-broken words of David from Psalm 22:1, “My God, my God why have you forsaken me?” (Matthew 27:46). This is the only time in the gospel accounts that Jesus prayed to his Father using the formal and distant name “God.” He knew how it felt to be in pain and to cry out for God and yet feel alone. He knew what it was like to long for the Father’s love and feel abandoned. He endured his darkest of all Dark Nights of the Soul on the cross for the joy of reconciling us to his Father (Hebrews 12:2). The Man Jesus Christ, to whom no affliction, no ill, no suffering is alien and who yet was the wholly innocent and righteous one, is praying in the Psalter through the mouth of his Church. 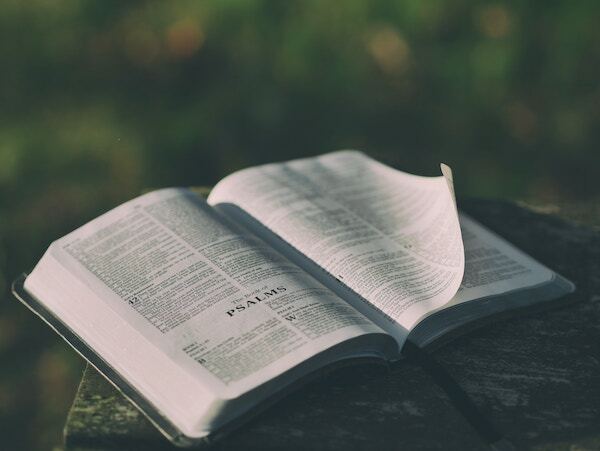 The Psalter is the prayer book of Jesus Christ… He prayed the Psalter and now it has become his prayer book for all time… Those who pray the psalms are joining in with the prayer of Jesus Christ, their prayer reaches the ears of God. Christ has become their intercessor (Life Together, pp. 45-46). The Apostle Paul also made use of the Psalms. He quoted the Psalms in his teaching (Acts 13:33), as did Peter (Acts 1:20), but apparently he also used them regularly in prayer as he encouraged us to sing psalms together (Colossians 3:16) and to speak to one another in psalms (Ephesians 5:19). In the first century since there were so few written scrolls of the Psalms that the way people would sing and speak psalms to one another was first to memorize and meditate on the them – praying the Psalms into their hearts – so that they could access them anytime. Most of the Psalms were written by David, and perhaps this is why he was singled out with the affirmation, “David… is a man after my own heart” (Acts 13:22). Indeed the Psalms are the Bible’s book of the heart in that they express emotion honestly and reverently. The Psalms show us how to pray out in words (spoken or written) our deepest hurts and longings, our struggles that leave us anxious or angry, our confessions of guilt, and our joyful thanks and praise so that we share all of our life experiences with our God who listens and responds. We lay out whatever it is that we feel and then we put our confidence in God. By praying the Psalms authentically with the heart of David we learn to trust the Lord and worship him in all of our life circumstances – including the most painful of all, the Dark Night of the Soul, when, despite our desperate prayers in the midst of suffering, God’s face remains hidden from us. For years I have been visiting the Prince of Peace Abbey in Oceanside, CA, which is a Benedictine monastery. The monks there join thousands of others from around the world to pray from the Psalms five times per day in their daily “divine office.” Together they prayerfully chant the psalms as they keep cycling through the Psalter over and over. I love their slow, melodic way of chanting the Psalms and the silent spaces they give during their prayer services. When I pray with them I enter into a chorus from heaven and yet at the same time it’s like it’s a prayer coming up from deep inside my heart and soul. I have also enjoyed experimenting with praying the Psalms in ways that access the right side of my brain (nonverbal, intuitive, creative) and help me to connect more deeply with God. I sing Psalms (even though I don’t know how to sing well!). I draw pictures of them, make collages, or find pictures on the Internet as illustrations (e.g., pictures of Jesus’ face or his passion, or a king inviting me to approach his throne). I pray Psalms with my body — reading them out loud exuberantly and gesturing with my hands or as I walk, joy, or hike. Other times I kneel or fall on my face to pray a Psalm. When a verse or image from the Psalmist jumps out at me (which happens a lot!) I like compose short little abiding prayers to help me give thanks and praise to God, draw close to Jesus, express love to each member of the Trinity, submit the parts of myself to God’s kingdom rule, “watch and pray” to overcome temptation. In the ancient pattern I’ve been praying the Psalms sequentially. I first learned this from Eugene Peterson by reading his book Under the Unpredictable Plant. I’ve been going through all 150 Psalms every two months and in this way I become familiar with and learn from all the Psalms and their types of prayer. And each day is God is in control of what Psalms I pray — it’s a joy to discover God’s providential provision and leading in what may seem happenstance. And when I come across a Psalm that doesn’t relate to my own experience I can pray that Psalm for someone else. My rhythm of life is praying the Psalms morning, noon, and night, carrying a Psalm or verse from one prayer time to the next, like passing a baton in the relay race of faith, which is to practice God’s presence continually and in all things. From the Psalmists I’ve learned that morning and evening prayer are especially important. My morning Psalms focus on themes of rising with the sun, submitting the day to God, or offering thanks and praise to my Lord. My evening Psalms focus on reflecting on the day, confessing my sins, lamenting to God about a struggle, or watching and praying in the dark. In contrast to the sequential approach I also pick and choose from different Psalms as needed (for myself or someone I’m interceding for). For many years I’ve found it helpful to find a Psalm that expresses my heart at that moment and let the prayer of the Psalmist and of Christ (many of the Psalms were prophetic of Christ and in each Psalm Jesus is already there praying!) become my prayer also. There are Psalms for seemingly every type of situation, emotion, and need. Psalm 57: God is glorious and loving – exalt him with a steadfast heart! Try praying it meditatively, changing the prepositions, like this: “Dear Lord, I seek to live in your kingdom, by your power, and for glory. Amen.” In, by, and for Christ — it’s a short prayer that covers everything! It’s like condensing the 150 Psalms into 16 words! Have you read praying with the body the psalms come to life by Roy DeLeon? A most extraordinary book in my opinion! Praise Yahshua for the Psalms He used them to heal my heart after a miscarriage and disappointed hopes. Later on I got pregnant again and this time I delivered a sweet baby boy.He is nine years old now and a great blessing! Praise Yahshua for healing and fulfilled hopes! Great article. Very inspiring and practical. Thank you for this very useful method to pray. God bless.